Two wheeler vehicles are very popular among Indian people. Nowadays, bikes are scooters are in great demands as these two wheeler vehicles are easy to ride and afford. However, riding bikes and scooters entails risk as well. A mishap in the road can lead to financial loss or injuries or even death of the riders. Although, it is not possible to ensure utmost security while riding but measures can be taken to minimize the extent of damages and losses. This is why two wheeler insurance plans are indispensable for two wheeler vehicles owners in India. There are many motor insurance companies in India that offer two wheeler insurance online policies. But, in order to choose the best two wheeler insurance plan in India bike and scooter riders need to evaluate a number of crucial factors such as speed and ratio of claim settlement Ratio, premium and term of two wheeler Insurance policy, network of cashless garages in India and the likes. Here is the chosen list of top 5 Two Wheeler Insurance companies in India in 2017 after considering all important parameters. The following list of top 5 two wheeler insurance companies will help you select the best provider. If you are on the lookout for the best two wheeler insurance plan in India in 2017 you can go for any of these 5 two wheeler insurance companies in India. If you want your two wheeler insurance company from public sector, this PSU insurance company can well be your best bet. This government owned company is financially robust and boasts “A” rating by AM Best. New India Assurance is known for its grievance resolution system which is flawless and claims processing which is quick and transparent. Like most insurers, New India Assurance also offers two different types of coverage. The comprehensive New India two wheeler insurance plan is more expensive than the liability only cover. Add-on covers are also available with New India two wheeler insurance plan for additional premium. Policyholders can buy and renew the New India two wheeler insurance plan online. After HDFC ERGO, Bajaj Allianz is one of the best two wheeler insurance companies in India’s private sector. ABP News declared Bajaj Allianz as the “Best General Insurance Company in Private Sector” in 2014. With Innovative products and impeccable services, Bajaj Allianz can be the go-to company for your two wheeler insurance online policy. Like many other insurers in India, Bajaj Allianz two wheeler insurance plans are also available for long terms. Policyholders can transfer up to a maximum of 50% NCB from any other bike insurance company in India. Reliance General Insurance is one of the top two wheeler insurance companies in India in 2017. You can buy or renew your two wheeler insurance plan online from Reliance if the benefits offered by this company suits your requirement. Bharti AXA two wheeler insurance covers physical injury of the insured in events like terrorist attacks accidents. Bharti AXA two wheeler insurance online policy covers the expense of servicing and replacement of parts of bike or scooter in cases of natural calamities and man-made disasters. If you are looking for a two wheeler insurance company in India with live customer support round the clock, Bharti AXA is the way to go. With each passing year, an increasing number of people are buying bikes and scooters in India. With the growing rate of two wheelers plying on Indian roads, the demand for a trustworthy two wheeler insurance company in India is also on the rise. You can select any one of from the list of two wheeler insurance companies mentioned above. Before making the final decision, it is always wise to compare two wheeler insurance online in terms of benefits, limitations price and other vital aspects. 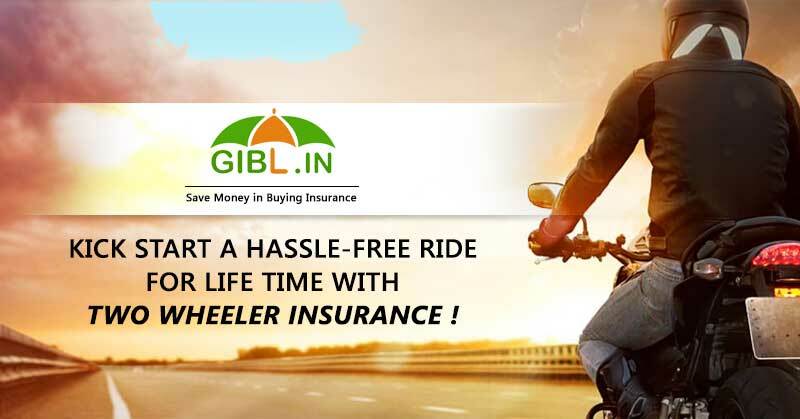 You can visit GIBL.IN, the premiere online insurance marketplace for a seamless comparison of multiple two wheeler insurance online plans and select the best two wheeler insurance company as per your requirement. You can also buy and renew two wheeler insurance online plans right from the portal of GIBL.IN.